Photo: Turkey giveaway at Jubilee Christian Church, Boston, MA (courtesy jubileeboston.org). In the Church of God in the United States, Thursday, November 24, 2016, will not just be another day to stay home from work. While many must clock in on Thanksgiving Day, others who don’t have to are choosing not to sleep in, kick back on the sofa, and watch football all day. Instead, they’re choosing to give back. Ephesians 2:10 is written on the tablet of their hearts, and their appetite for serving others is greater than their appetite for turkey and all the trimmings. They understand that thankfulness and giving go hand-in-hand, and that such values must not be restricted to the fourth Thursday in November. Nevertheless, in worship, in teaching, in good works, and in fellowship, the Church of God loves to celebrate Thanksgiving. In worship, the Thanksgiving theme weaves its way back to the early days of the movement. 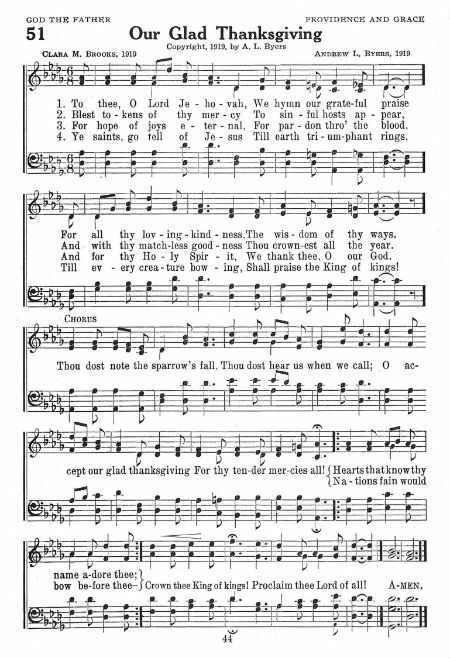 Heritage songs found in the 1930 Hymns and Spiritual Songs, such as “Our Glad Thanksgiving,” penned by Clara M. Brooks and set to music by Andrew L. Byers, lifts up the goodness of God that we experience all year long. Our services today echo the refrain of thanksgiving that rang out in the early days of our movement by reaching hands in fellowship to every blood-washed one. First Church of God in New Martinsville, West Virginia, is just one of several Church of God congregations across the country this week to come together with believers from other fellowships to celebrate God’s faithfulness. The community Thanksgiving service on Sunday in New Martinsville was hosted by First Church of God and represented a variety of denominations of the local ministerial association. Jesus is the subject! In teaching, Church of God congregations emphasized thankfulness and God’s provision. Some churches have dedicated the entire month of November to celebrating what God has done. On Thanksgiving Sunday, Pastor Marty Grubbs proclaimed to the congregation at Crossings Community Church in Oklahoma City that, “The depth of our gratitude determines the depth of our love for Jesus and others.” For Crossings, and for countless congregations across the country, teaching about thanksgiving and learning about thanksgiving wasn’t enough. They also had to do something about it. 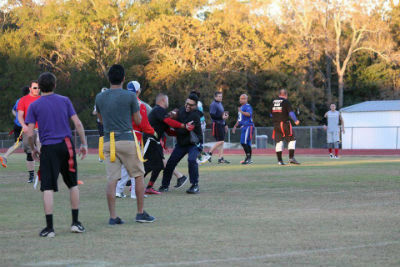 Photo: Turkey Bowl at Crosspointe Fellowship, Kilgore, TX. In good works, Jubilee Christian Church, one of our Church of God congregations in Boston, Massachusetts, was swift to engage in the change-the-world business this Thanksgiving season. Created anew in Christ Jesus to do the works which he prepared in advance, Jubilee volunteers poured heart and soul into collecting and distributing turkeys to needy families for Thanksgiving. With cold weather approaching, they’ve also gathered coats to distribute, as well. First Church of God in Vero Beach, Florida, will also celebrate Thanksgiving in good works—they’ve pulled out all the stops for another fantastic feast for the community on Thanksgiving Day. Pastors and laypeople from California to Connecticut have traded in watching the parade and the dog show for serving in soup kitchens and shelters. In fellowship, Crosspointe Fellowship Church in Kilgore, Texas, reminds us that the Church of God can worship, teach, and do good works very well, but still have fun, too. After a day of observing the real value of the Thanksgiving season, on Sunday they kicked off their second annual Turkey Bowl. Reminder: Church of God Ministries will be closed on Thursday, November 24 and Friday, November 25, in observance of the Thanksgiving holiday in the United States. Were you blessed by reading this story? Support the ongoing work of Church of God Ministries with your gift to the World Ministry Fund at http://www.jesusisthesubject.org/world-ministry-fund/. This entry was posted in All Church of God and tagged Boston, community service, Crosspointe Fellowship, fellowship, First Church of God, Florida, football, hymns, Jubilee Christian Church, Kilgore, Massachusetts, New Martinsville, outreach, Texas, Thanksgiving, Turkey, Vero Beach, West Virginia, worship. Bookmark the permalink.